The Economy 48''L shelf is a great multifunctional shelf to use on the Economy Aisle and Wall Gondola units. The shelf hooks into 1'' slotted uprights with a separate shelf bracket that attaches at two positions. 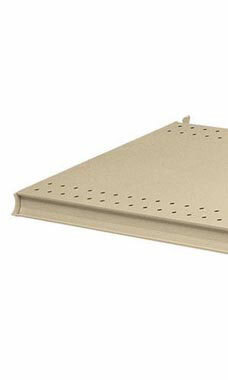 The shelf features two sets of round peg holes for optional fencing. Additional features include shelf adjustment from flat to a 15º slope. Steel shelves support 150 lbs. per shelf. The shelf is almond color (Sahara) to complement the aisle and wall gondola units. Learn how to Organize Your Store with Gondolas in the Customer Connection section of our website!